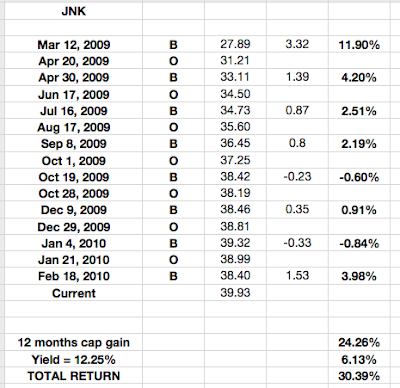 A freind of mine like to trade junk bonds, specifically JNK. 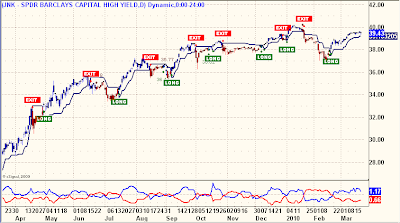 The investment seeks results that correspond generally to the price and yield performance, before fees and expenses, of the Barclays Capital High Yield Very Liquid index. The fund normally invests at least 80% of total assets in securities that comprise its benchmark index. It may also invest its other assets in securities not included in its benchmark index. The problem with JNK and any yield sensitive instrument is that when yields go up, the capital value goes down and when the economy goes south, well, in 2007-2008 JNK's went from the mid-40's to the mid-20's. That's a heck of a price to pay for a little extra yield. Below are the trades for the past 12 months in a proforma, which includes a capture of half of the monthly dividends, which is an assumption of being in the fund about half of the time. What neither the table nor the chart above shows is how the model was in cash for most of the 2008 drop from the mid-40's to the mid 20's. As you should know by now, the model sidesteps all nasty declines with an objective, rule-based, trend-following algorithm. If you like the high-yield stuff but abhor the risk of higher rates or sinking economies, this model is one way to capture the best of the junk bonds and their generous yields while managing risk by only being Long when rates are dropping and/or JNK is rising in price. Are you adding this to your subscription service? American hockey fans know to first consider Canadian royalty trusts, before trying out the thin ice of junk bonds at a time balance sheets of most financials, munis and sovereigns are fraudulent. Yield is still excellent (despite run-up since 03/09). PMT/UN.to hedges some of its gas production. Its yield is high. Despite hedging some of its gas, its price has not done same as Alta Gas, but that is likely due to whatever each has done with oil component of their production. And Alta has other, diversified enterprises. time to put on the warrior spirit in the days, weeks, months ahead. Yes, just did exactly that. It will appear on in next Trend Models Update.